You'll be £8.00 closer to your next £10.00 credit when you purchase Scottish Steam - A Celebration. What's this? Scotland is renowned worldwide for its engineering prowess, which of course included locomotive building. This lavishly illustrated and detailed publication celebrates standard gauge steam locomotive building North of the Border. Focussing not only on the achievements of the major companies, North British Locomotive Co Ltd, Neilson & Co Ltd, Neilson Reid & Co Ltd, William Bearmore Ltd, Sharp Stewart & Co Ltd,and Andrew Barclay, Sons & Co Ltd it also highlights the contribution made by several of the smaller, but nevertheless significant locomotive builders. Details of the output of the several railway company locomotive building works are also included. All of the Scottish built locomotive classes which came into British Railway's ownership are featured ,and a large majority of the carefully selected images are published for the first time. Scottish Steam celebrates the significant contribution made by Scottish railway engineering workshops to steam locomotive development. Excellent photographs accompany this detailed look at the significant contribution of Scottish railway workshops to steam locomotive development. A must for railway enthusiasts. It is a completist's bible, but it also comes illustrated with so many hitherto unseen images that even the less committed steam junkie would enjoy it. Scotland shaped the railway industry; the railway industry shaped Scotland. Respected photo journalist Keith Langston looks at the local and national contributors to Scottish locomotive production, for example, Dubs & Co, which elevated Scottish steam to the world's stage. A thorough insight into the different classes of railway that emerged from the late 19th to the early 20th century. Practically every locomotive design is covered in words and photographs, some of them in a preservation context. In summary, this is a catalogue of all that has been lost to new technology. As seen in the Inverurie Herald. This large-format photographic album is the ultimate publication for the enthusiast who loves/loved steam traction in Scotland. The amount of research and photograph archive material put into producing this book pays off in what can only be described as 'breath-taking'...and this is NO exaggeration. 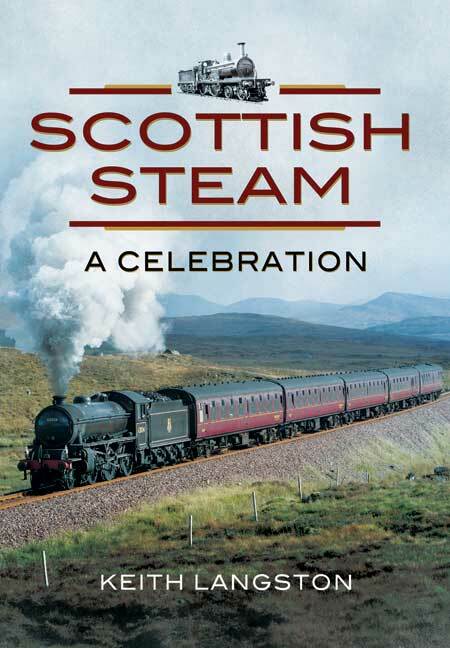 If you love Scottish-built steam - buy it! As seen in The Sunday Post. As seen in the Ellon Times. As seen in the Cumbernauld News. Complemented with glossy images ranging from pre-war to modern day Britain, this is a go-to guide for referencing. As Seen in the Winsford Guardian.